Hinweise zu über 400 Fachartikel von und mit Arnold Benz sind auf der ETH Homepage zu finden (in Englisch). 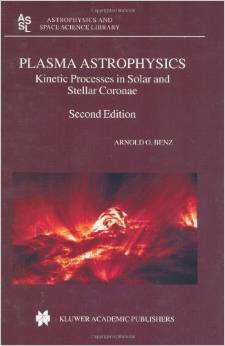 This textbook is intended as an introduction to the physics of solar and stellar coronae, emphasizing kinetic plasma processes. It is addressed to observational astronomers, graduate students, and advanced undergraduates without a background in plasma physics. Coronal physics is today a vast field with many different aims and goals. So- ing out the really important aspects of an observed phenomenon and using the physics best suited for the case is a formidable problem. There are already several excellent books, oriented toward the interests of astrophysicists, that deal with the magnetohydrodynamics of stellar atmospheres, radiation transport, and radiation theory. In kinetic processes, the different particle velocities play an important role. This is the case when particle collisions can be neglected, for example in very brief phenomena – such as one period of a high-frequency wave – or in effects produced by energetic particles with very long collision times. Some of the most persistent problems of solar physics, like coronal heating, shock waves, flare energy release, and particle acceleration, are likely to be at least partially related to such p- cesses. Study of the Sun is not regarded here as an end in itself, but as the source of information for more general stellar applications. Our understanding of stellar processes relies heavily, in turn, on our understanding of solar processes. Thus an introduction to what is happening in hot, dilute coronae necessarily starts with the plasma physics of our nearest star.